San Francisco Airport has also been shutdown. UPDATED: 7:54 p.m. - Officials have confirmed that two peole were killed in this afternoon's plane crash at San Francisco Airport and after 60 people were reported missing, officials are saying that 59 of those unacounted for have been found. UPDATED: 4:48 p.m - News everyone feared is now being reported by CBS News that two people were killed, with 61 injured, some critically. CBS sites this is according to the San Francisco Fire Department. UPDATED: 3:49 p.m. - According to San Francisco Fire/EMS they have 190 patients (This does not include patients already transported following the crash) with minor to moderate injuries who are being triaged and treated at the International Terminal. Fire/EMS officials said that of the 190 patients with minor to moderate injuries, 75 of them will be transported to nearby hospitals. At this time officials are in the process of also making sure that all patients are accounted for. 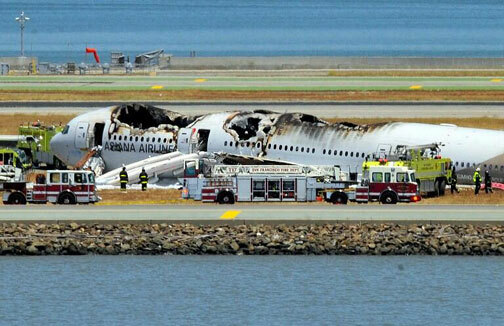 Below are eye witness accounts from today's plane crash at San Francisco International Airport.